Home Ink Cartridge News What Do The Letters Mean At The End Of Your Printer Model Numbers? 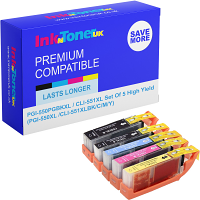 Looking to buy a printer at Ink N Toner UK? You may get confused with so many model numbers as they all look quite similar with additional letters in the end. for example: M3825DW, M4075FW, M2625D etc. But what do these letters at the end of model number mean? These letters usually stand for a feature or function that the printer has. So a combination of multiple letters indicates that it comes with a few number of features. What do printer model suffixes mean? N: Network Your printer has some sort of network features such as an Ethernet port or wi-fi connectivity. If your printer has NW, this could just be wireless networking and may not include an Ethernet port. X: Duplex, Extra Tray and Network Your printer contains a number of extra features. Please refer to your printer spec list to see what they are. When these letters are combined together in your printer model number, it usually means that it your printer includes a combination of those features. For instance DN means your printer comes with duplex and networking capability. Another example is DTW which means that your printer comes with duplex, extra tray and wireless capability. If you want to ensure that you are 100% getting these features, do check the full specification of the printer you want to buy to confirm the features you need.